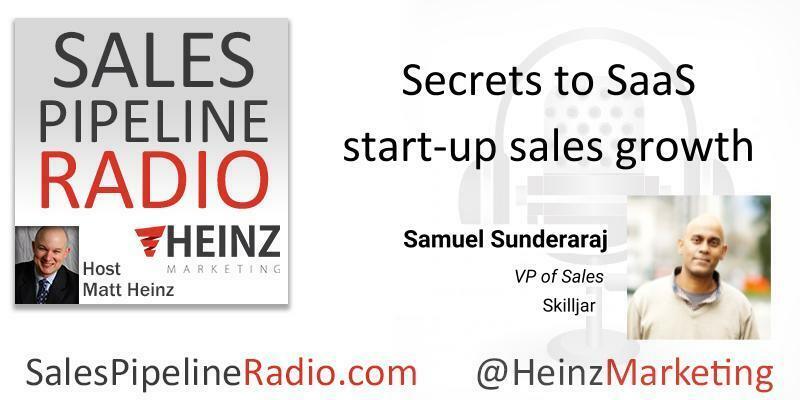 In this episode, listen in to Samuel Sunderaraj, VP of Sales at Skilljar. Check out the full transcription on our blog starting Mon. 6/4. What's the state of SAS sales? What does it look like today? And for folks that are either at the front lines or managing an SAS organization, what are the keys to making SAS sales work today? He'll also talk about how good sellers can actually be still at the forefront of the buying process, at the top of the buying process to provide that value. He'll share about the people side of growing a sales organization. It's one thing to put numbers in a spreadsheet and say, "Well, if we call this many people, convert this many deals, we'll hit our number," but you still have people that you're managing as part of that. Hear about the importance and some of the keys to building a sales organization, a high performing sales organization that also prioritizes the people within it. What about managing expectations? What about the boards objectives? What about the investor objectives? How do you manage that when you're in the middle and you're leading the sales organization, having to motivate the team, but also sort of set expectations from above? All this and a lot more! Experience in building a successful sales organization from scratch, including recruiting, hiring, and developing compensation plans. - Territory and Market Optimization – executing to high conversions on the active funnel.